<— FABULOUS OF ALL FABULOUSNESS!!! Fulfilling and exhilarating, twisty-turny, funny and traumatic!! How can that be? I dunno but she’s just that good. (P.S. 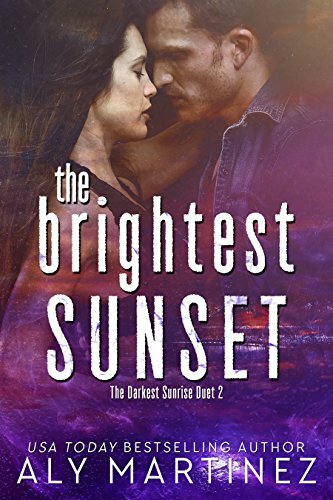 Check out my review of book #1 ➔ Book Review – The Darkest Sunrise by Aly Martinez)). You can read either review first, ’cause I promise. No spoilers!! This duet had my heart and my soul!!! This is NOT just a love story, my friends (although it is PLENTY of that… meet-cute, romance, steam and sweet, and angst). That said, it’s not just misunderstandings and jealousy or angst. It’s just SO much more. This is the whole shebang. The whole story. The pacing was almost perfect. Two haunted characters (one, extremely jaded) that come together with a bit of “best friend” trickery. 😉 But that meet cute had me laughing SO hard. And then… that delicious slow burn, budding via a tentative bond over a deeply personal traumas that both characters carried secretly within them. But it’s not all dark, I promise you. There is so much comedy relief. TONS OF relief, in the midst of this chaos. “What’s that?” Porter asked, tilting his head to the papers in my hand. *snort* I cackled so hard. P.S. Tanner is HIS hot celebrity chef brother. 😉 That she calls “Sloth”. Tee heeeeeeeee!!! Oh you’ll see why. GAH!!! This story is so perfectly laid out. The incredible back story was revealed to us slowly but surely, keeping me on my toes and on the edge of my seat for so many reasons. Their personal histories colliding with their current reality, and my jaw was on the floor. I simply could not put it down!! She’s a doctor (top of her speciality) and HE’s got a young son that needs her desperately. She doesn’t want to take on any children in her practice (always referring them to other doctors), but he is desperate, and manages to finagle his way into her proximity. But OH EM GEE it is NOT easy. None of it is, and I won’t tell you why. But is it fun? YES!!!!! Er… well. That’s not very nice of me to say because there are some serious tear-jerking moments, some infuriating ones too. Words. More f**king words. All of them the truth. Those poor characters were put through the ringer!!! I’d woken up that morning with a family and a woman I was falling in love with. And, now, my life was in shambles. The feelings and reactions are intense, and I just know if I had videoed myself while reading, my faces would have been hilarious. DARNIT!!! I should have!!! What an opportunity for a reaction video, is a series like this. Goes to show you, I was so into it, I didn’t even think of coming out. Nope. You will NEVER forget this duet. EVER! Like I said in the previous review, the best is to go in blind. I pretty much did (minus having read the blurb of book #1 and going in with a slight preconceived notion). In fact, a few fellow readers said NOPE (after reading the blurb) and I must insist you guys!!!!!! GO IN!! FULL ON. Do it! I was delightfully surprised at the trajectory this one took. …his mask faltered and revealed his true emotions—and they were heartbreaking. Unique, exciting, introspective and enlightening. Okay, perhaps a tad predictable in some instances but written so wonderfully, the characters, scenes, setting and dialogue so realistic – right down to the children – perfection!!! Each characters is wholeheartedly their own person, it’s as if she wrote about them direct from real life. Even if you guessed or suspected some things, the surprises and twists are SO worth it and the journey this one will take you on will be a non-stop, fulfilling ride the whole way through. But of course, I understand from a writing prospective, it’s to keep the emotional intensity and twists on a roll to evoke reader reactions. 😉 And boy did they! Bah! Who cares about my hiccups? They were few and far between and very light. I won’t remember them. All I’ll remember is this awesome story and how it made me feel… EVERYTHING. This book (and series) took me THERE. ALL THE WAY. I’m dying here…..need this book NOW! Cannot wait to finish this story!!! FYI this Duet series is on kindle unlimited right now!